Home » News » Ekaterina Gilman defends PhD! 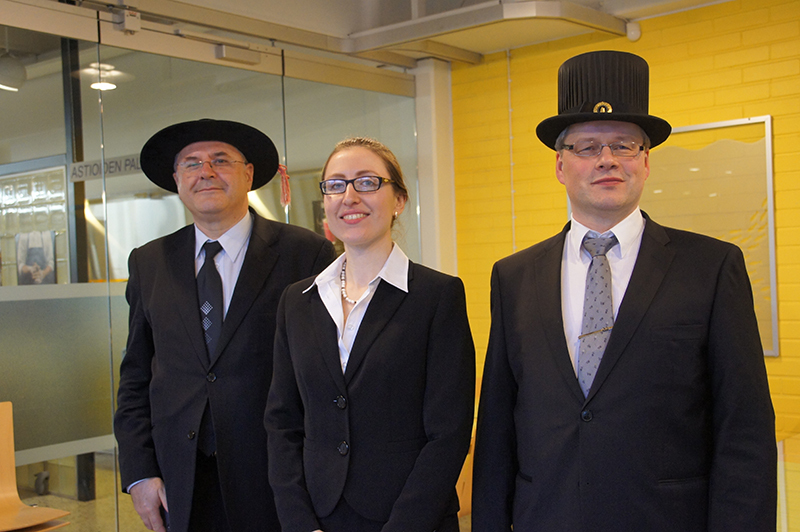 On 30 October 2015, Ekaterina Gilman has successfully defended her dissertation “Exploring the use of rule-based reasoning in ubiquitous computing applications“, supervised by Professor Jukka Riekki. The PhD thesis was reviewed by Professor Claudio Bettini (University of Milan) and Professor Tommi Mikkonen (Tampere University of Technology). Professor Arkady Zaslavsky (CSIRO, Australia) served as the opponent in the doctoral defense. Context reasoning is one of the key blocks in ubiquitous applications, which generally supports decision-making by transforming the acquired context of the environment and users to possible actions. Different techniques can be used to reason about context in ubiquitous computing domain, like machine learning mechanisms. Ekaterina’s thesis concentrates on rule-based context reasoning in ubiquitous applications. Generally, her thesis contributes to understanding how rule-based reasoning can be used in ubiquitous computing. For that, the research presented explores rule-based context reasoning from three perspectives: to implement the functionality of ubiquitous applications, to support the creation of ubiquitous applications, and to achieve self-adaptation. Each perspective is carefully analyzed based on real prototypes, simulations, or theoretical studies. Research highlights opportunities and critical issues requiring attention for using rule-based reasoning from different perspectives, with different scales, and with different architectures. The results of this research can be used as guidelines for developers of ubiquitous applications. Photo: Taken shortly after Ekaterina’s defense. From left: Arkady Zaslavsky, Ekaterina Gilman, Jukka Riekki.